We now have a hearth in our living room. In front of our fireplace. The one who’s chimney doesn’t go all the way to the top. He still needs to clean the inside. It’s a different world working with stone construction rather than wood. 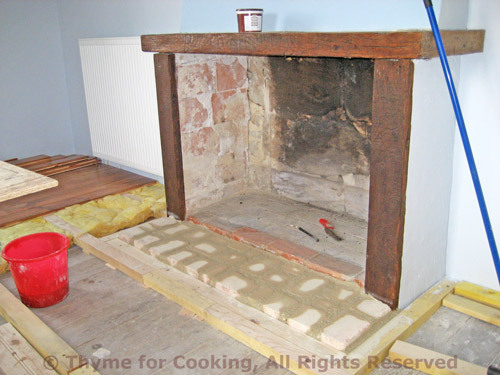 The back of the fireplace has the same huge limestone blocks as the house, the sides were built out at a later date and need to be ‘finished’. The floor is coming along slowly. He has to stain and varnish each plank before it goes down, so it’s a bit time consuming. The good news is, he’s doing all the work in that room, and with that lovely insulation on the floor he now has a warm place to work. On the cooking side I’ve been getting phone calls every other day keeping me posted on my cook top – in other words, telling me it’s not fixed yet. It will probably be ready Friday. We can’t pick it up Friday. EDF, the electric company, is coming to read the meter on Friday afternoon. They sent me a letter 2 weeks ago for the appointment. Yes, our electric company makes an appointment to read our meter. They only read it twice a year and in these old houses the meters are inside. In the Vendée the meter was on the wall in the living room. Lovely fixture, with all the wires for the house coming out of it… on the wall, naturally. Wires are not inside walls here – ’cause the walls are stone, remember? Here it’s in the barn but they still have to come inside to read it. Thus the appointment. Requested formally, by letter. I digress… Back to the cook top. Apparently someone took pity on my frustrated self because they gave me a ‘loaner’ cook top to use while mine is being repaired. In celebration, and because it was cold, I made soup. Twice. And neither one ended up looking like it should. In my mind Borscht should be purple or red-purple. Mine was red. It tasted like it should; was, in fact, quite delicious. Maybe next time I’ll add some red cabbage. That might help the color. I didn’t put any cabbage in because…. Well, because I didn’t want that much soup. It’s hard to make a first course soup for two…. Cut beets, potato and carrot into small pieces. Chop onion. Put vegetables, chicken broth, herbs and spices into a medium saucepan. Bring to a boil, cover, reduce heat and simmer until vegetables are tender, about 20 minutes. Remove and discard bay leaves. Purée in blender or use an immersion blender. Stir in tomato paste and vinegar, gently bring just to a boil. 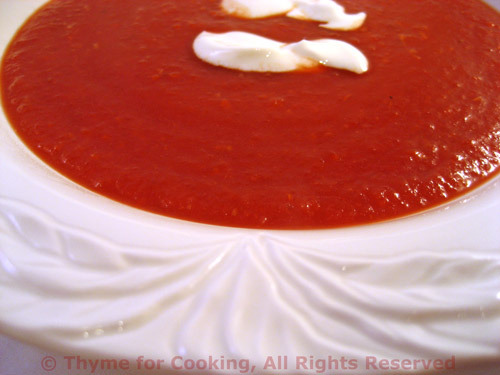 Ladle into soup plates and serve, garnished with Greek Yogurt. Note: I buy whole, cooked, peeled beetroot – it’s the only we get it here. If the beets are raw you must first cook them before using them for anything, including soup. To cook, gently scrube the dirt off and trim the stem and root end to about an inch. Cover with water and boil until tender, 45 – 90 minutes, depending on size. You could also roast them: rub with a bit of oil, wrap in foil and roast for about the same length of time. Allow to cool slightly, then slip the skins off and trim the root and stem. Now they are ready to eat or use. And your entire kitchen and person will be a lovely shade of red…. This could be a fun first course for a Valentine’s Day Dinner. what is beets? I don’t know what is that? really.. I have never thought to puree borscht but that would be delicious. Wouldn’t it be perfect for Valentine’s Day? I love these house updates – fun to track the progress. I think the borscht is beautiful, even if it is a different color. That floor is going to look wonderful when it’s done. I think it looks quite vibrant! Good to see the place coming along! I love the color of your soup. Yes, I suppose it could be more of a purple hue, but it’s really quite beautiful just the way it is. Oh dear Katie, looks like the cook top won’t arrive yet..it must be frustrating! Great soup by the way! You are so right about everything becoming red when you peel the beets. It doesn’t seem to matter how much I try not to I always end up with red on me and my clothes. Your recipe for Borscht sounds very tasty and I like the color. Good luck with the ongoing renovations. The colour of that soup is stunningly beautiful! And not far off from what I would have expected. I often make a beet/zucchini/blackbean slop to serve with pasta and it usually turns out about the same colour – maybe with just a little more of a magenta tinge. Nice idea to serve it as a first course for Valentine’s Day. I only wish I knew how to make the yoghurt into a heart-shaped pattern. There must be a way to do that with a knife after the yoghurt has been spooned onto the top of the soup…. MC, beetroot, it’s the same thing. Zoomie, it was pretty… I love the house progress! Joey, vibrant – good word, thanks! Christine, I guess it comes down to expectations, doesn’t it? I’ll change mine. Hazel, the room is coming along… a few boards a day. Wanda, but it’s such a pretty red! Loki, I have no choice regarding the beetroot… I can only get it cooked. It’s in big bins in the produce section of all the supermarkets – cooked and peeled, with a big fork to use to put it in the plastic bags. My mother always cooked it first, so I guess that, combined with the way a buy, it formed my opinion. But that explains the color. Elizabeth, beet/zucchini/black bean slop…. sounds great – do you have proportions or is it just whatever? The heart would just take patience – and the willingness to spoon out and eat the failures. When I make that kind of slop, I usually use one large uncooked beet (peeled and sliced thinly), an onion (sliced thinly), a small zucchini (sliced in half moons), a good shot of black beans (drained), a chopped tomato (if I have one) and some sort of dried fruit (3 or 4 apricots or prunes, chopped). I start the whole mess by heating olive oil in a pan and throwing in a handful of brown mustard seeds, some fennel seeds and a scattering of chilli flakes (that, of course, you would omit). As soon as the seeds start popping, I add the onion. Once the onion is soft and starting to turn gold, I might add some garlic as well – depending on whether I feel like adding garlic. Then the beet slices. I toss them to cover with oil then cover the pan and let them cook for about 5 minutes. Then the zucchini. If things seem to be too dry (they usually are) I throw in a little cider vinegar. And the tomato, if using. And the dried fruit. Cover it again and simmer until the pasta (or rice, or couscous) and the beets are done. I taste it and add salt and pepper. If it seems to sharp, I add a bit of cream or yoghurt. If I don’t have any beans ready, I’ve used toasted pecans. I can’t remember it ever turning out badly. It’s never quite the same, of course. I, absolutely, adore fresh beets which is the way I purchase them. I bake them in the oven as you described. I know of Borscht Soup, but for some reason, I have never taken the time to prepare it nor even had the opportunity to eat it. 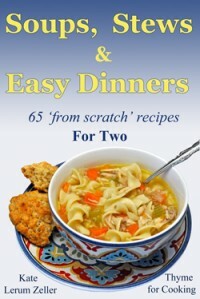 Being that I do love soups of all kinds and always looking for more creative ways to cook them, I will try your recipe. It is very interesting that tomato paste is one of the ingredients. Nevertheless, it sounds delicious.